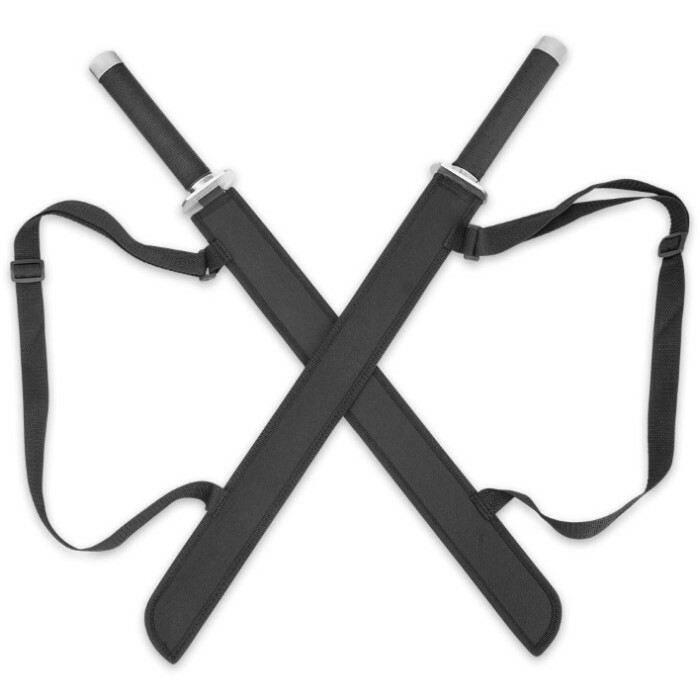 Double Strike Ninja Twin Sword Set With Shoulder Harness | BUDK.com - Knives & Swords At The Lowest Prices! These vicious twins pack twice the punch, bringing you two quality swords at one low price. The 29 1/2" blades feature heat-treated black finishes and piercing tanto points. The black cord-wrapped handles provide a sure grip with a high-polish guard and pommel. 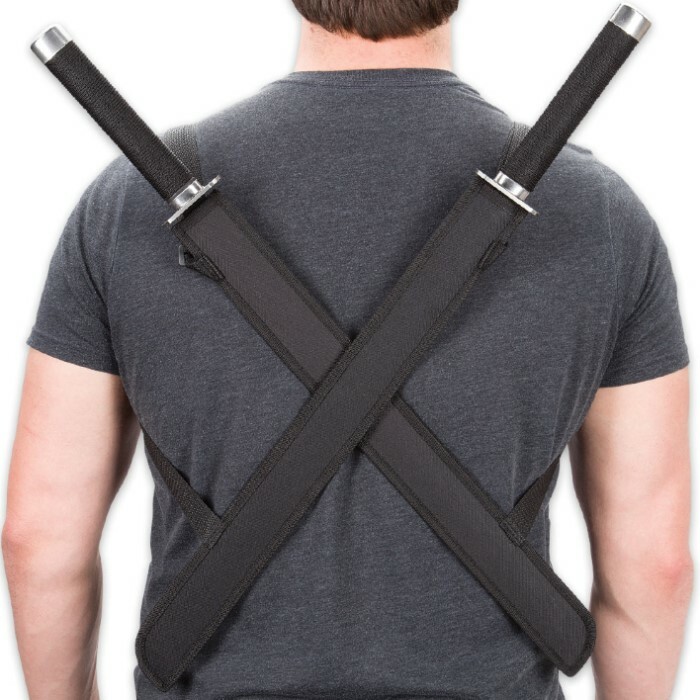 You can carry them on your back in true ninja fashion with the included shoulder harness sheath. Each sword measures 25 1/2" overall. I saw the price drop on these and thought they must not be very great, but I was amazed when I opened these up and felt the balance and how sharp these are straight out of the package. Best freaking 13 dollars ever spent in my life. This is probably the best deal on budk right now. These swords came sharp from the box, had very comfortable handles and great feel to them. My only complaints would be that the sheaths are floppy nylon, so you can't slide the sword back into the sheaths like a ninja. Also do not try to swing these at trees... these swords are better for self defense and cool looks. I tried to swing them at a tree and the second swing with one of them it snapped at the handle because the handles are hollow and the blade is not full tang. Other than that, these are great swords and I would recommend buying them. Response: Please contact customer service at 800-735-3326 . I am very disappointed with this product, at first look those are very nice (balance, quality of the blade) but the hilt, the hand part is made of weak plastic ! I have only hit the wind 3 times before it break and goes right in the ground ! Fortunately no one were hurt ! Please change the "hand part" put wood instead or plain material !!!! Response: We are sorry you were disappointed with this product. Please contact customer service if you would like a refund or replacement. 800-735-3326. Out of the box the blade is decently sharp. Both swords hand are very light and looks great.Sadly the back strap is not adjustable.With the swords in the backstrap they looks like wings,you have to keep constant tension at the front so it looks good and is easy to access.Next is the hilt, very loosely wrapped and can unravel with little ease.Another downside is the hilt is made of plastic,if swung at a semi solid object with the right force the hilt will snap.Its a 80% for ascetic look and 20% for show and tell.But overall it looks great feels great and looks great. Just got these swords yesterday. The straps for the sheaths are too long and I hoped that the sheaths would be stitched together instead of being held together with Velcro, but other than that, they're not bad. Surpassed my expectations. Definitely worth the price. Wish the sheath was more than just flaps and I also wish they were adjustable. But I'm truly happy with my purchase overall. Can't wait to shop again. 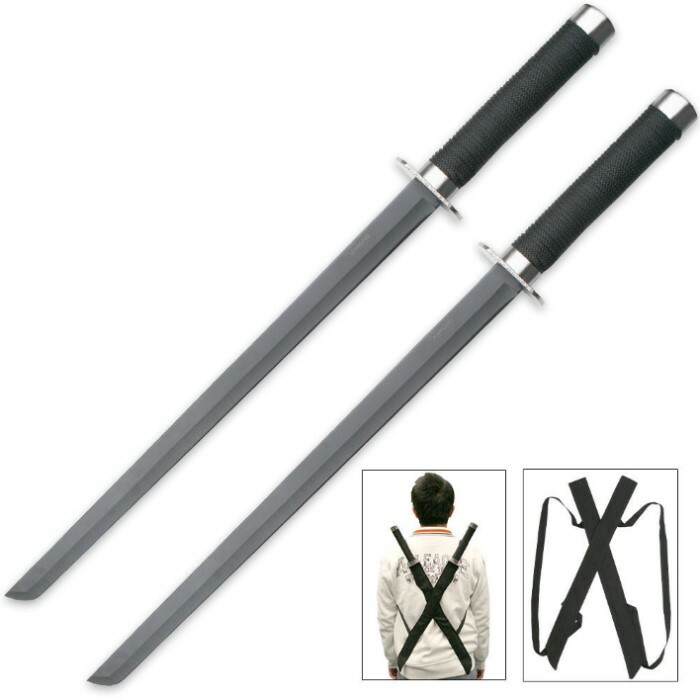 Swords look cool, back strap is decent, aren't usable, I wouldn't buy. Customer service is AMAZING!!!!!!!!!!!! Do NOT buy this if you plan to use it. It's meant for display only.First swing and the blade came right out of the plastic handle. and the blade only goes in not even 3 inches and is held in with a little glue. The blade itself is so dull that it wouldn't cut a twig. They say you get what you pay for, well I'd say the price is still too damn high. everything that I bought from this site has broken except 2 knifes. So that's 2 out of 7. True Swords my @$$!! !